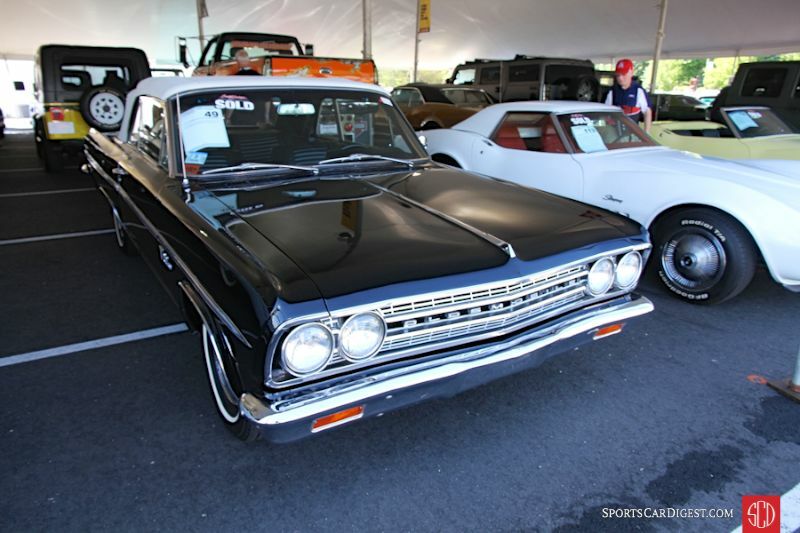 When Barrett-Jackson announced its first auction in New England many people schooled in the region’s collector car auction history scratched their heads and wondered, ‘why’? New Englanders are feisty, flinty, skeptical and inherently deal-seeking. Add in proximity to New York City and it gets even worse. New England is a tough environment where only a few collector car auctions have, despite a lively collecting and vintage racing scene, survived, and then only on a small scale. Hints that the Mohegan Tribal Council and Mohegan Sun management were auto-centric suggested possibilities, but nothing, as in nothing, prepared for the transformation that Mohegan Sun and Barrett-Jackson worked on the landscape of Mohegan Sun, a tightly constrained and intricately interwoven site along the Thames River in Uncasville, roughly halfway between New York and Boston. Barrett-Jackson brought its full experience [perhaps better called a spectacle] with vendors, exhibitors, thrill rides with professional drivers from Ford, Dodge and Chevy and an array of food trucks to complement Mohegan Sun’s not-insignificant array of eateries. There were no deep fried turkey legs as in WestWorld, but you could have a decent lobster roll. How much New England is that? And the crowd responded. Thursday was mobbed. MaryBeth Anderson, publisher of the Barrett-Jackson catalogs, agreed that Thursday at Mohegan Sun was thronged like Saturday at WestWorld. It only got worse. By Friday all the spectator tickets for Saturday were sold out; they literally ran out of printed tickets. Bidder registration ran a third or more over estimate; the bidder area on the Arena floor filled up and overflowed into the upper level seats. It was a sensation for car collectors in the Northeast, an opportunity to see, feel and taste the Barrett-Jackson extravaganza without having to fly to Phoenix or Palm Beach. Wait? ‘What about the cars’ you ask? The consignment was, according to Craig Jackson, about 20 percent over what they had expected. Regular Barrett-Jackson consignors brought fleets of cars from places where they’d never been exposed to the Northeast’s cold winters, slushy highways and winters of ice melting salt and chemicals. It created a rare opportunity to transfuse some fresh blood into the Northeast’s collector car pool, and collectors took advantage of it. The one shortcoming of the Mohegan Sun location was using a parking structure to display and preview the auction cars. It was dark, dank, dimly and erratically lit, making it a great place to sell cars with problems: without a good flashlight it wasn’t possible to see much of anything. One smart consignor with a quality car bought four stick-on LED light pucks to show off the car’s immaculate engine compartment. The pictures of cars in the garage in this report are a tribute to the quality and flexibility of modern digital photography; it was a lot darker than it looks. Prices? Some were low, some were high, most were just right. Selling the expensive Showcase cars consigned with reserves proved to be difficult, as has been the case since the beginning of the year. The much maligned ‘1%’ is keeping its hands in its pockets while the ‘middle class’ seems to be alive, well and feeling flush, at least that’s the impression that selling vast numbers of $33,000 cars creates. Wall Street plutocrats from Fairfield County are not buying 383 Super Bees, it’s plumbers, dentists, attorneys and UPS drivers. Barrett-Jackson has a five-year deal with Mohegan Sun and after this year’s success both Barrett-Jackson and the Sun are undoubtedly looking forward to 2017. Andrew Newton contributed on-site observations for about 2/3 of the cars described. 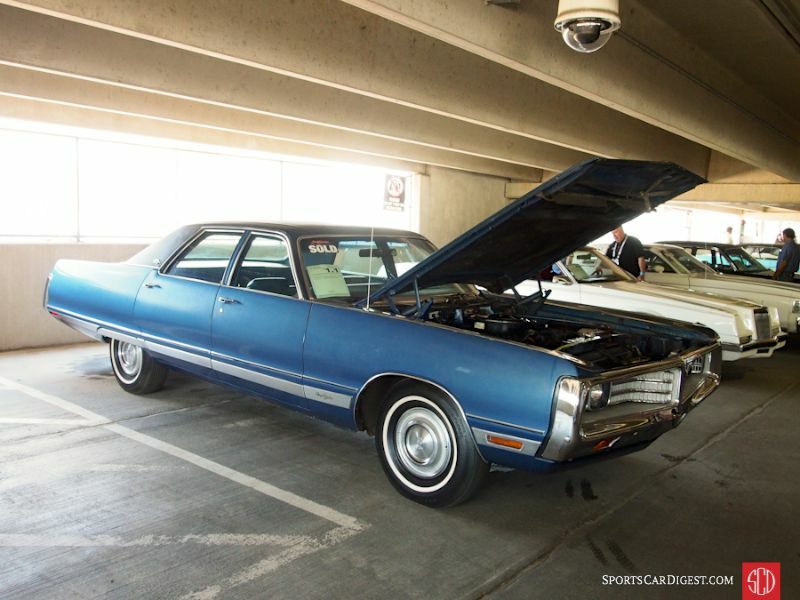 Lot # 1.1 1972 Chrysler New Yorker 4-Dr. Sedan; S/N CS41T2C291915; Blue, Dark Blue vinyl roof/Blue vinyl, cloth; Unrestored original, 2- condition; Hammered Sold at $4,500 plus commission of 10.00%; Final Price $4,950. No Reserve – 440/225hp, automatic, power steering, power brakes, air conditioning, AM-FM, wheel covers, narrow whitewalls, power seat. – Dry, surface rusted unrestored underbody, original paint with some discoloration under the fender top trim. Good original chrome and stainless, excellent original interior. Represented as an original, unrestored car on its original tires and showing 3,530 believable miles. – If nothing else this car, the first one across the block at Barrett-Jackson’s first Northeast auction, should be lovingly preserved as a social commentary and relic of the values of the early 70’s. It is Huge and its originality and condition are more than impressive, a Preservation Class winner. At $1.12/pound it’s cheaper than hamburger and a good value by any measure. 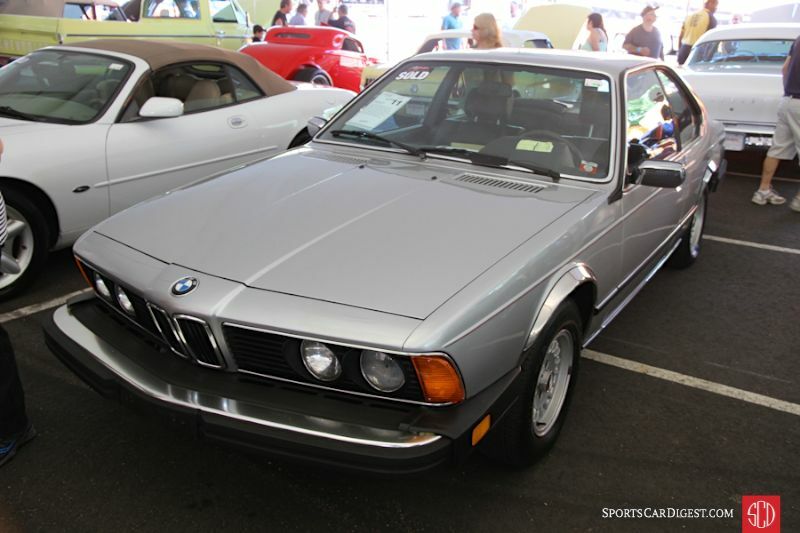 Lot # 11 1983 BMW 633CSi Coupe; S/N WBAEB8407D6995028; Silver/Black leather; Unrestored original, 3- condition; Hammered Sold at $6,200 plus commission of 10.00%; Final Price $6,820. No Reserve. – Alloy wheels, sunroof, air conditioning, power windows, Kenwood CD stereo. – Odometer reads 0, but it’s represented with 66,000 actual miles. Fairly dull original paint with numerous chips around the hood. Several light scratches on the hood and several more on the roof and sunroof. Scuffed up, lightly scratched wheels and the BMW badge stickers are coming off the caps at all four corners. Dull switchgear. Sound upholstery. Used but tidy underneath. CARFAX shows an accident in 2003. Very much a used car, and expensive service bills may very well be ahead. – The general quality of cars at this inaugural Barrett-Jackson sale was quite high. This car is an exception. As an ’80s 6-Series with unknown maintenance history and an accident, it was fortunate to get even this much and the seller should be happy to be rid of it and move on. 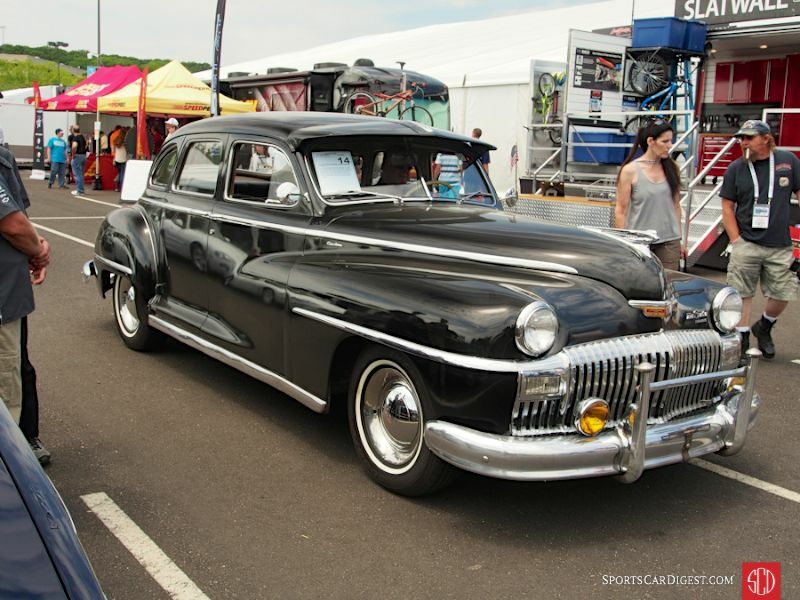 Lot # 14 1949 DeSoto Custom 4-Dr. Sedan; S/N 5950042; Black/Black vinyl, cloth; Visually maintained, largely original, 3- condition; Hammered Sold at $6,200 plus commission of 10.00%; Final Price $6,820. No Reserve – Fluid Drive, hubcaps, Sombrero trim rings, narrow whitewalls, pushbutton radio, fog lights, grille guard, windshield sun visor. – Mediocre old repaint with cracks and fisheyes. Fair older interior. Scratched chrome and pitted taillights. Repaired fenders and doors don’t fit flush. Right front fender is filled and blistered. Looks OK from ten feet and runs OK, but isn’t much more than a relic. The odometer reads 36,050 and is probably on its second time around. – While it is large enough inside to hold a neighborhood party the sloppy body work does not bode well for its survival or trouble free enjoyment and it brought a price appropriate to its condition and lack of much intrinsic appeal except to someone whose father or grandfather owned something similar. 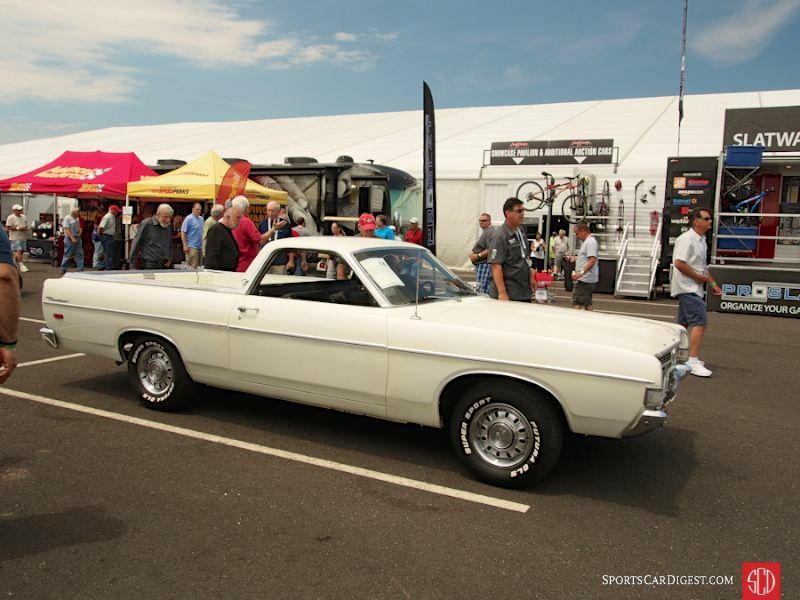 Lot # 18 1968 Ford Ranchero Pickup; S/N 8K48F239473; White/Black vinyl; Visually maintained, largely original, 4+ condition; Hammered Sold at $11,000 plus commission of 10.00%; Final Price $12,100. No Reserve – 302/210hp now with a 351 and a 4-barrel, automatic, power steering, manual brakes, GT wheels, trim rings, hubcaps, aftermarket cassette stereo, buckets and console. – Suspension sags to the left side. Body is repaired poorly, doors, sills and fenders are visibly filled. Thin chrome. Dirty engine compartment. Engine upgraded to a four-barrel. Not likely to be satisfying to own. – This is a huge result for a Ranchero in such parlous condition, particularly when it sold at Mecum’s Kissimmee auction two years ago in 2014 for a still-generous $8,100. The buyer must have wanted a Ranchero very badly to pay this much for it; the underbidder ‘won’ on this transaction. 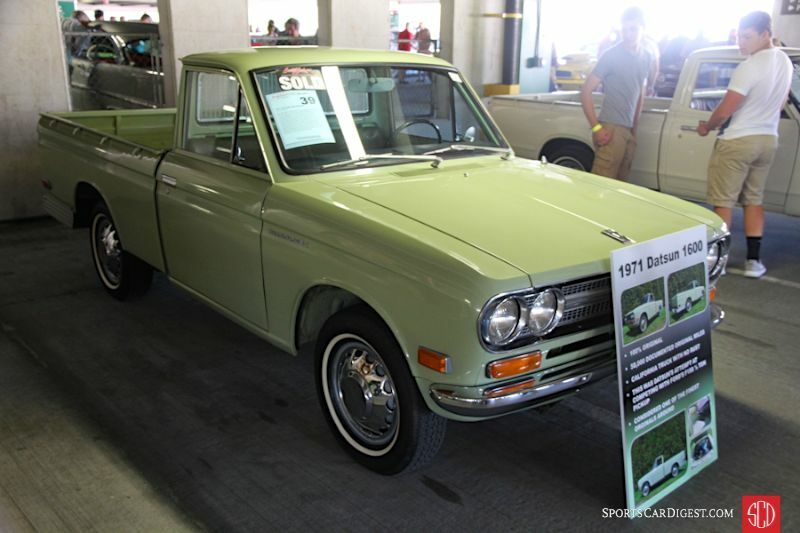 Lot # 39 1971 Datsun 1600 Pickup; S/N PL521458694; Light Green/Green vinyl; Unrestored original, 2 condition; Hammered Sold at $16,500 plus commission of 10.00%; Final Price $18,150. No Reserve. – Wheel covers, narrow whitewalls, floor shift, factory radio, documented with the original sales invoice and comes with an original key fob, owner’s manual and antenna keys. – Represented as all original and that it was used as a daily driver for 30 years. Showing 59,008 miles represented as original. Lots of chips and scratches around the edge of the bed and way more in the bed itself. Several scratches on the tail and rear bumper. Interior is very good and lightly worn. Frame shows plenty of use but surprisingly there is no rust of note, attributable to the claim that it came from California. Probably one of the most well preserved ’72 Datsun pickups around. – It could also be the most expensive one around. Any more than this for a 1600 cc pickup truck would be just about unthinkable, and this much for such a well-used truck is close. Still, it is so rare that arguing with the bidders’ determination of value is difficult, given its originality. 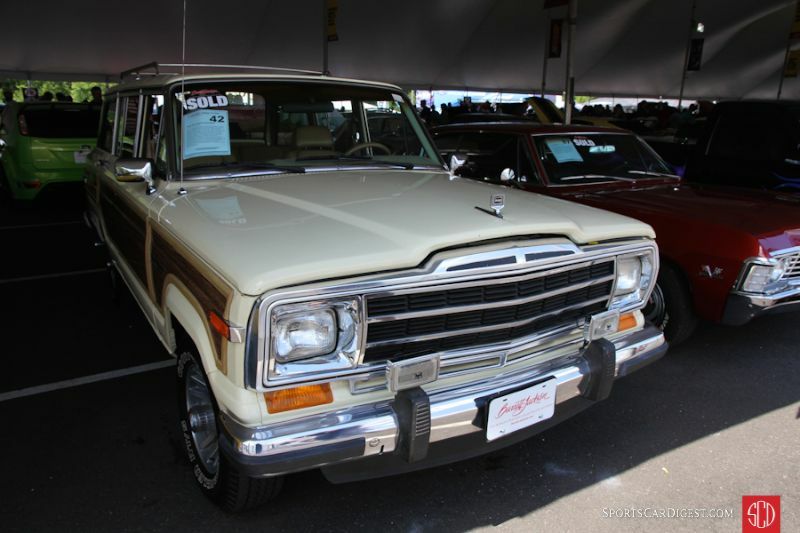 Lot # 42 1988 Jeep Grand Wagoneer Station Wagon 4×4; S/N 1JCNJ15U6JT062988; Buff Yellow, Wood/Beige leather; Unrestored original, 3+ condition; Hammered Sold at $16,000 plus commission of 10.00%; Final Price $17,600. No Reserve. – 360/144hp, automatic, Goodyear Wrangler tires, roof rack, power windows, power locks, air conditioning, power rear window, factory cassette stereo, column shift. – Very good original interior with lightly worn seats and some scratches on the steering column. Dull, lightly scratched brightwork. Dull original paint with light chips and scratches throughout. A few small, light cracks in the weather stripping. Some scratches in the faux wood, but it’s surprisingly good. Clean and dry underneath from its long residence in dry New Mexico. CARFAX shows minor damage in 1995, but no other details and no evidence of a crash showing. Original and showing age, but shockingly solid considering the 143,450 miles on the odometer. – Sold at Barrett-Jackson Palm Beach last year for $11,000. The Grand Wagoneer market hasn’t exploded or anything since then, but this example found a more appreciative audience in Connecticut who bid it to a high but not excessive result. Some people really like Grand Wagoneers and continue to drive them almost as a statement of disdain for political correctness. This combination of rarity, exceptional original condition and go-anywhere capability is hard to beat, as is the price. 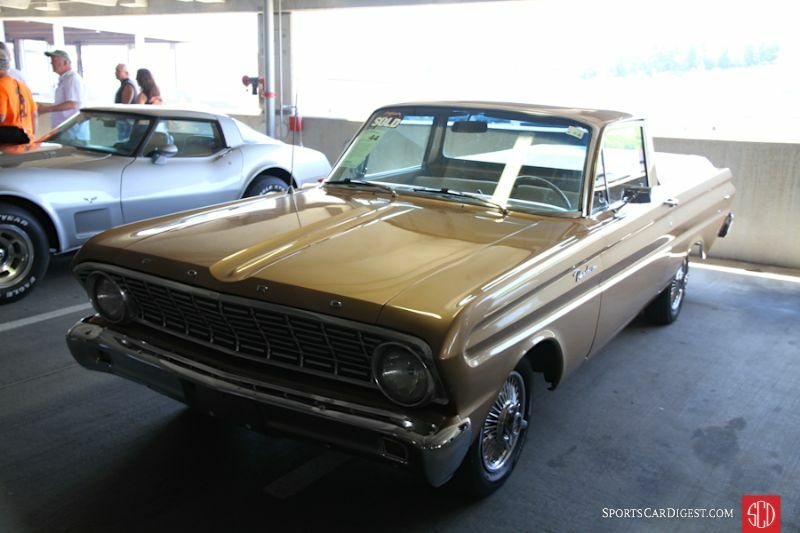 Lot # 44 1964 Ford Falcon Ranchero Pickup; S/N 4H27U180177; Prairie Bronze Metallic/Beige vinyl with Brown cloth inserts; Cosmetic restoration, 2- condition; Hammered Sold at $12,500 plus commission of 10.00%; Final Price $13,750. No Reserve. – 200/116hp, 3-speed, spinner wire wheel covers, Dunlop tires, dual mirrors, beige vinyl bed cover, column shift, 8-track stereo, Stewart Warner amp and oil pressure gauges. – Big chip in the tail. More small chips around the filler cap. Otherwise very good quality paint. Very good chrome. Uneven door gaps. Good, lightly worn interior with faded original dash and switchgear. Lightly scratched wheel covers. Original but clean and maintained underneath. A straightforward cosmetic restoration, but a good one. – Sold at the Dragone Hershey sale in 2014 for $8,525, then sold at Bonhams’ Simeone sale last year for $7,480. Barrett-Jackson was apparently the right venue for this Ranchero, because this result was the only one close to what it deserves. Lot # 49 1963 Oldsmobile F-85 Cutlass Convertible; S/N 631K11823; Black/Black vinyl; White vinyl top; Unrestored original, 2- condition; Hammered Sold at $19,000 plus commission of 10.00%; Final Price $20,900. No Reserve. – 215/185hp, 4-speed, wheel covers, Cooper narrow whitewalls, bucket seats, floor shift, console tach, pushbutton radio. – Good, shiny paint other than several long scratches on the left front fender, a few small blisters on the nose and another on the left rear fender. Driver’s side door doesn’t fit flush. A few spots of dirt on the convertible top. Very good interior. Aftermarket sports steering wheel. Represented as all original and showing 63,506 miles. – Twenty-four years ago this F-85 was a no-sale at the Kruse auction in Scottsdale on a reported bid of $8,000. Heaven only knows where it’s been since then, but wherever it was it was treated well. Powered by GM’s innovative little aluminum V-8 and with a 4-speed it’s going to be a fun driver and no one should take issue with the price its condition, equipment and originality brought. Lot # 50 1969 Ford Fairlane 500 2-Dr. Hardtop; S/N 9A33F236816; Meadowlark Yellow, Black vinyl roof/Black vinyl; Recent restoration, 2 condition; Hammered Sold at $15,000 plus commission of 10.00%; Final Price $16,500. No Reserve. – 302/220hp, automatic, hub caps and trim rings, Radial T/A tires, hood scoop, woodrim steering wheel, column shift, Philco radio, Stewart Warner electric and oil pressure gauges, 9″ rear end, uninstalled Ford dealer A/C unit in the trunk. – Uneven hood gaps. Clean, straight like new roof vinyl. Very good recent paint and chrome. The original interior is so good that it was left alone during restoration. Very clean and restored underneath. A fresh, very well done car with new suspension front and rear. Like new, and a rarely seen late Fairlane 500. – ‘First, do no harm’ should be a restorer’s mantra and the work done on this Fairlane is a good example of putting it into effect. It’s had just enough to give the owner pride of ownership without destroying much of its originality and if for that reason alone is a sound value.